"London through the looking glass" is a very good way to describe this book, I think. 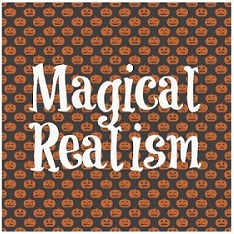 But I'd also tack on a caveat: "London through the looking glass, told in history text format." 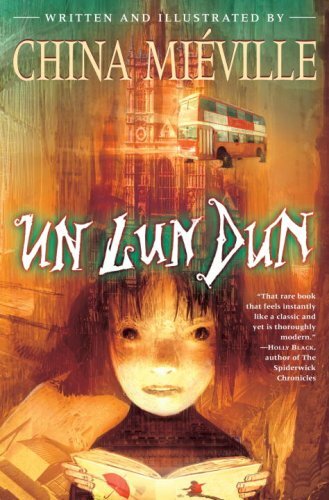 Because Un Lun Dun, in theory, sounds like it would have been an exciting adventure of a child-hero saving a world from a malicious Smog-monster. Along the way, she encounters allies and enemies alike, and fights to fulfill the prophesied battle against the main villain. She learns about the gloriously strange world of UnLondon and how all the things that make up UnLondon come to be. But the narration is full of awkward transitions, and almost deliberate introductions to one more strange thing of UnLondon. Like I said, it kind of reads like a history text that follows Deeba, the Unchosen One, as she journeys to save a world she's come to love after one short trip. Or maybe it kind of reads like a gaming guide, where each and every weird new experience, thing, or group of people is awkwardly defined to our hero by an NPC (non-player character, in game-speak), so that we, as the readers, know what's going on. Because, boy does this book have a LOT of strange new vocabulary! It almost got to a point where I just stopped trying to read 'unbrella' with the 'n', and just glossed over it as 'umbrella' and mentally tagging the definition of it on. Otherwise, all of these strange words just made the book kind of difficult to read smoothly. Which both adds onto the interesting world of UnLondon, as well as makes me stumble over my reading trying to figure out how I'm supposed to pronounce that without a glossary. Anyway, as I had said, Un Lun Dun has all the potential to be an exciting adventure. 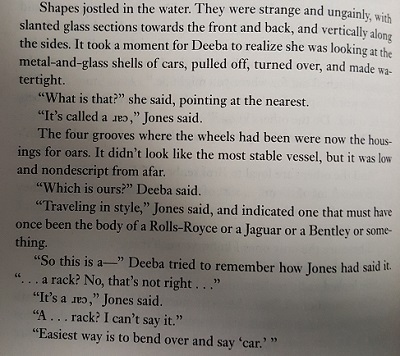 It even defies traditional fantasy tropes and stars Deeba, the friend of the Chosen One, successfully putting Zanna, the Chosen One, on hiatus for the majority of the book. Things don't just go wrong for the prophecy and the Propheseers, but they go extremely, terribly wrong. And it's up to Deeba to either accomplish what Zanna should have been the one to do... or do things her own way. Really, if I were about a decade younger, I probably would have found myself immensely enjoying Un Lun Dun for the fact that the sidekick is the one who saves the day. But there were a lot of little things about Deeba that frustrated me, even as I continued to feel quite impressed by the turn of events that the book takes, because nothing happens the way you would ever expect most fantasies with Chosen Ones to happen. But I'm not really complaining all that much. The entirety of the Un Lun Dun world is extremely creative. In fact, it DID remind me of a video game world--and those are usually fun, even if not the best. The characters were interesting, the adventure was exciting, and there really wasn't anything wrong with the imagination of UnLondon. It just wasn't really my thing, I suppose.